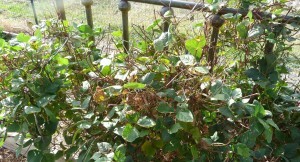 Some things in the garden still survive, but one serious freeze and they will drop like flies. 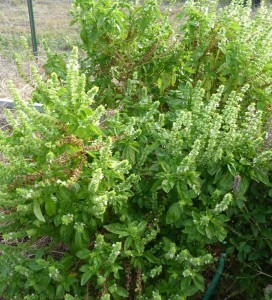 Basil of any type. Just so delicate. Because I love to make pesto (see my Recipes to Diet for category) I decided to try a variety of basil this year to see if varieties make any difference to the taste of the pesto. In fact, they do. Problem is I have 8 of them. I cut basil all afternoon, passed some off on my neighbor and cleaned all mine for pesto making. Should keep me going all winter. That night it froze but I covered up a couple of the basil plants that did survive. I have already made up a batch of this and it’s very good. 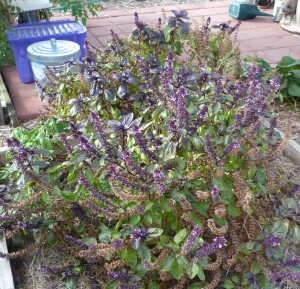 A bit more peppery than normal basil and I am a pepper lover. Plus it gives a deep rich color to the pesto. This bush is huge. Takes up more than half of one bed. 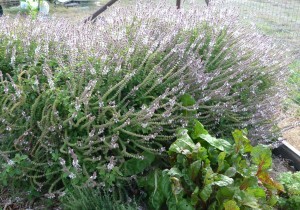 Problem is, the leaves are tiny, but the blooms are beautiful and the bees love it. I don’t have enough patience to pick off millions of tiny leaves, so I’ve deemed it decorative and good for the environment. I shall plant one again next year. No, not basil, but my favorite thing for making pesto. Nice and spicy with a kick of pepper. This will keep growing all winter long. Nothing kills arugula. Great in salads, too. Now let’s get to the things that are giving out. I am determined to get five quarts out of this pea stand and I’m just about there. Think about all the luck I’ll have next year! I’m going to plant more of these next year because they are fun and easy to grow. Not many bug problems either. But this next freeze, they’re probably goners. 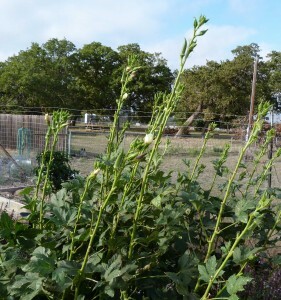 Never did grow right this year, though I got plenty of okra. Need to can that, too. It likes the heat and is barely hanging on. It’ll die with the next freeze, too. But not all is lost in The Funny Farm! I’ve started my fall garden and let’s check on it. 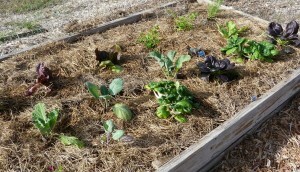 Remember the square foot garden? Well this is it and frankly, I’m not happy with it at all. Not much has come up. Maybe I shouldn’t have mulched it immediately. Maybe it needs to be more level. 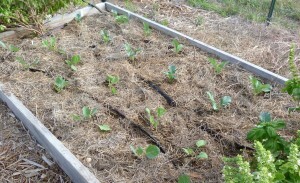 I don’t know, but I’m going to keep experimenting with this type of planting through the winter and will let you know. 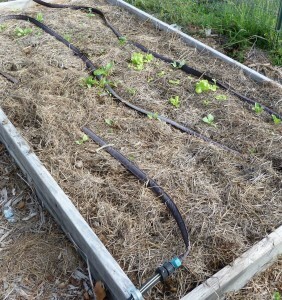 Still, have some lettuce, radishes, beets and carrots coming up. I had such wonderful produce from this group of plants last year. All except the Brussel Sprouts. 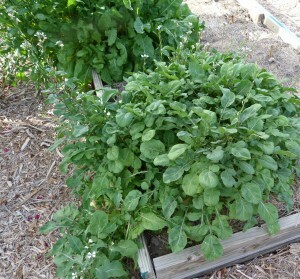 I planted them again this year and then read about them in my Vegetable Gardening book. Forget it! You have to plant them at the perfect time, keep them cool enough to get to fall and then baby them through the winter. Oh who knows, I might just get lucky! Finally, the last of the new beds. What’s in there? Well it started with a present from My Crazy Cousin. She bought me some “Toy Choi” because she thought it was cute. I understand that completely. I think it’s cute, too. It’s mini Bok Choi and comes in green and purple. Haven’t tried it in a stir fry yet, but that’s just around the corner. There’s a purple cabbage in there, radicchio, a purple broccoli (who knew? ), mescalin, catnip (for the cats), a red lavender, cheddar cauliflower (supposed to be orange) and a couple of celery plants. Read about those too, and they are also impossible to grow. 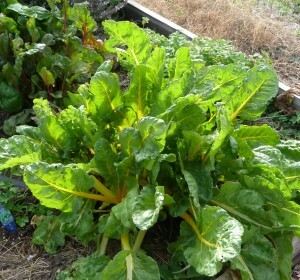 But the leaves are delicious and they’d be great in salads or stews. That’s the November Funny Farm update! Tomorrow’s column day and Friday, well who knows? Maybe we’ll talk about cute men.